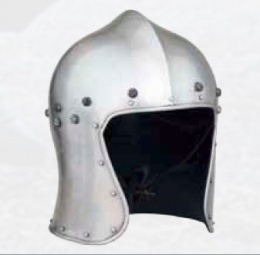 A barbute (termed a barbuta in Italian) is a visorless war helmet of 15th-century Italian design. The North Itailan Barbuta Helmet is an open faced Barbute Helm, without the traditional T-shaped opening. It is a taller version of the Sallet that is typically more Italian in design. The helmet comes complete with an adjustable leather straps. 16 gauge steel. This page was last modified on 13 May 2014, at 16:11.